Ratings are averaged based on 425 reviews. Plantation Island resort offered many different activities for kids and adults. Both Kids Club and baby sitting services were very good. Three pool areas with plenty of shade and seating. Buffet style dining offered a good amount of options. Cost for WiFi / Bike Hire / snacks etc high but in line with other resorts. Our family of five had a fantastic time at Plantation Island, it was everything we imagined a relaxing Fiji holiday should be, only wished we had stayed longer! great location, many activities, kids loved it particularly the kids club. Still a great holiday with kids. Staff are wonderful & we all had a great time. This is a great spot for families. Plenty of activities to do and heaps of nice places to chill out and relax. Certainly would recommend. Thank you to the beautiful Fijian people for our amazing holiday in paradise! We had such a fantastic time. We are already looking at booking our next trip back to Plantation Island. The staff were amazing and so friendly It was really sad leaving the island at the end of the week. I would recommend a trip to Plantation Island to everybody!!!!! This was our second time at Plantation and we can't wait to go again. My whole family was their for my son's 50th we could not have picked a better place. We had a ball. The staff were very friendly and we found a lot to do as they have many activities. We did not want to leave shuch a relaxed beatiful place. Hope to go back some time. Plantation island resort was such an amazing place to visit, my 6 year old had an absolute ball at kids club and the staff were fantasic and did everything they could possibly do to make everyone feel relaxed and welcome in every way possible. I would highly recommend this resort for a family vacation, we are already discussing when we will return. Plantation Island was a great place to relax and enjoy the environment. A lovely resort for families. Friendly staff and a spectacular location with wonderful snorkeling and swimming in the lagoon. Brilliant kids club and nannies. Bures clean and well serviced. Food mostly very good, buffet breakfasts lovely. Our children (2,4) loved it here. The beautiful Fijian staff embraced our daughters and made them feel very special. A perfect holiday for our family. Great location. Rooms were perfect. Food could have been better but loved the pizzeria for the kids. Snorkeling was amazing. the Beachfront bures are just perfect! My family and I had a great time at plantation, initially we were a little worried because the resort is rated at three stars but on arrival and after seeing the resort & our room we were relieved and reasonably impressed, it’s actually a lovely place to stay and we have four young kids from 2 to 7 years old and they had a great time, the location was perfect, the swimming and snorkelling was amazing. Our kids didn’t want to leave at the end. It’s not a five star resort but it’s very practical for young families and the staff were great. Thanks for the recommendation and helping us get there. Nice resort and super friendly staff. Food was very expensive but overall pretty good! Like going home to visit family. So friendly. This is our second time at Plantation Island because the staff are so friendly and welcoming. Nothing is too much trouble. Sometimes as a parent you find the need to have a rest to recover from taking young children on holiday......not on Plantation Island. Love the fact that there are no tv’s in the rooms, means total involvement of all family members. The renovations and improvements that are being made will make it even better. We will definately be visiting again. We loved our stay which felt like a “real Fiji” experience. Kids loved paddle boards, kayaks, water parks, pool hopping and Bula bikes. Take plenty of sunscreen including Zinc, rashies and hats. Studio garden Bure was spacious and serviced daily. Buffet food was ok if you ate early. Black coral restaurant was excellent but you need to book days in advance. There are lots of food options at nearby musket cove if you don’t want to buy the meal plan. Meal plan was convenient for us with young kids. Plenty of few activities offered day and night. No tv and limited wifi was not a problem as the kids were kept busy with all the activities. This was a great family holiday! Very relaxing and welcoming holiday. Great place and beautiful location. Staff were fantastic. 3 Star Resort, 5 Star Service.. Our 3rd trip to the resort and gets better everytime.. Recommended for those who leave their troubles behind and embrace the culture and love that the beautiful Fijian staff provide in abundance.. We will stay nowhere else.. Awesome rooms and was easy to organise cots for our kids. Nice big layout of the resort but lots of the walkways are sand so our pram is a bit worse for wear. Most of the beach activities were complimentary and fun but the bike hire is quite expensive which are great to get to go exploring the island. Staff were amazing (especially our friend Wise!!!). The island and resort looks as good as the photos! Staff very friendly as is the fiji way. I found the food really good, improved from a prior stay at the resort 5yrs ago. Equipment for water activities was all quite new in excellent condition giving the whole family lots of options for entertainment. Overall we had a fantastic time, found our trip to be fantastic value for what we received. Although there are current building works occuring at the resort from new rooms being built this was well out of the way and it had no impact on our stay. Been here 6 times with my wife celebrating our wedding anniversary and once for our daughters 30th birthday with our granddaughter. Accomodation has been/is comfortable with no TV's so I suppose 3 star, its clean, but a bit tired. But this did not concern us since we go there for the peace, tranquillity, sheer beauty and wonderful Fiji experience. The Resort is upgrading in stages through 2020 hence there will be major infrastructure improvements, new accommodation, venue (pools etc). General Manager Alex Wilson is a gentleman very helpful, pleasant and a pleasure to have a yarn with. Great for families. We have never had issues with children, guests or noise. We have walked around the island picking and eating mangoes and loving the scenery. But hey, please don't go there--if it gets too popular prices will probably go up accordingly. The staff are very friendly, approachable and knowledgeable. I've asked for change of room because I was expecting kids' beds to be in separate room from parents (we took 1 bedroom garden view). They moved us to another room the next day. We took halfboard meal, food is good. Good for families to stay because there are many activities to choose from. The nightly entertainment and games are so fun that we look forward to it. Overall, it was a very pleasant stay. We had best holiday ever :-) we loved Fiji and its people, you Guys are amazing. VINAKA ?? TravelonLine.com team delivered on all aspects of our holiday. Flights, transfers and accommodation arranged perfectly. Plantation Island resort was a great choice for our family (my husband & I along with our disabled daughter, our son, his wife and our grandchildren aged 3 & 1). Magnificent sandy beach, crystal clear ocean, golf tennis 3 pools and as much or as little as you want to do. However Fiji in general is very expensive for food & drinks. Thanks to all travel consultants who I talked to during the planning stage. I’d highly recommend Travelonline. A great place to stay! You can do as much or as little as you like. Needs to have a Continental Breakfast option for those people who don't require a full breakfast everyday. Plantation Island is beautiful! From the coconut trees to the beautiful water, it really lives up to the picturesque islands you imagine when going on holidays. This is an island for everyone - kids, families, friends and couples. Although the food and drinks are a little expensive, there is plenty of variety (and happy hours). You can either relax all day in the water or a beachside hammock or be active and ride bikes, surf, sail, snorkel or island hop! Looking forward to coming back again one day! 2nd time better than the first!! We were so warmly welcomed back to PIR, this time as returnee guests. Many of the staff remembered us and greeted us by our names! We have previously been as a couple, and with family/friends (no kids) and stay at the Lomani end which is quieter. It is absolute paradise and I would recommend to anyone, especially with this online deal. We are expecting our first child, and looking forward to them growing up with this annual vacation destination. The staff there are amazing and soooo good with kids!!! Loved our stay on Plantation Island.Will go back next year. I have been to this island six times ! We are return visitors to Plantation Island. Still think it is the best, hospitality, service, the Fijian people, absolutely awesome. Good resort for families with young children. Resort looking a bit tired and can do with a bit of a refurbishment. Our room (garden bure) was good and included aircon. Look up facebook group "Dan's Fijian Surf Tours" for a great service that allows you to surf when you want, where you want. Loved the stay. Meals were ordinary. We stayed at the end of Sept and would highly recommend to anyone with young kids. Drinking at the bar was pretty expensive, but the half board meal plan we had was great.. there is a shop at musket cove where you can buy bread and other lunch stuff. hire of the bula bikes make getting around the resort really easy. Staff are amazing. I will be returning. Hopefully soon! The location is postcard-perfect, the Garden Burre was clean and spacious for my family, the beach a short walk away, several dining options with a variable menu to suit all, and some of the friendliest staff I've ever met where no request was a trouble. And ensure you don't miss the nightly activities in the Copra Shed! Thank you Raffe Hotels for a beautiful holiday that we will remember for a long time. Spent 7 nights on the Malolo Lailai Island and Plantation Island Resort. We loved it. So much to do, especially for kids. A lot of families although there were couples and a wedding held whilst we were there. They are currently upgrading some areas of the resort which will be fabulous when finished. The best side of the resort is to the right of the jetty, much quitter and away from all the action so much more relaxing at night. Hire Bula Bikes to get around and visit the neighboring Musket Cove resort and supermarket, much cheaper to buy supplies there. Bring as much food over as you can as we got over the buffet dinners and ate at the snack hut most of the time. The buffet was perfect for the kids thou. So much to do, a lot of free water activities and the water is just crystal clear. Magic place, we cant wait to go back!!! We all thoroughly enjoyed our holiday at the resort! We had a great time doing some of the free activities (for adults and kids), tours, local snorkeling and just watching the fish jump as we relaxed watching the tide go in and out. Just what we needed to unwind from the daily stresses. A great family holiday destination. Great value family holiday. Great location. Beach front bure was clean, quiet and well appointed. All staff were super friendly and helpful as you would expect in Fiji. Plenty to keep you busy. Can't wait to go back. We loved our stay. It is not 5 star but the location and activities make up for the dated rooms and ok service. Staff are warm and friendly. Food is hit and miss; some great some ordinary. We however had a great time and would love to go back! Plantation island is the perfect location for families. So much for the kids to do. We hired Bula Bikes and rode around the island. Rooms are clean, spacious and serviced daily. Food was great with lots of variety. We will be back!!! Resort is perfect for families with kids of all ages - babies through to teenagers. Excellent value for money. Great relaxed, child friendly resort with plenty of eating options. Loads of activities & tours from the island. Will definitely return. We stayed at plantation island resort for 10 nights and loved every minute of it. The location is 10/10, the water, beaches are spectacular. The accommodation is comfortable. It had everything we needed. The staff were fantastic and very accomodating. The food was good. Of the 3 options at the resort the Black Coral is the best, food and service were excellent. It’s also a kid haven, so much for them to do. We will def be returning again. Thoroughly enjoyed our first time at plantation with our children. Its a great place to stay and great for families. Will be back that's for sure. We travelled with our son and his wife and their 2 children aged 2 and 4. We had a garden bure which was perfect as we were close to everything we were a bit concerned that it maybe a bit noisy but not so, very quiet at night. Something's need updating like the wood area around pool needed repairs and and was a bit disappointed at the decor in dinning room could have been a bit more suited to island life. Overall though we had a wonderful time. I would recommend this resort to anybody. Very well run and the service was amazing. Had a great holiday at plantation island !! Stayed in the beach front Bure was perfect location for the kids as well as they could play on the beach at the front of our room !! Highly recommend a family holiday to relax while the kids are entertained would def come back !! Thanks for a great holiday!! Great place for families with amazingly friendly staff and incredible surroundings. Not the place to go if you are expecting 5 stars, but a beatiful place for a family getaway at an affordable price. My favourite place in the world - i will always go back as it has pristine beaches and wonderful staff there. They are doing a lot of improvements as well all the time. I would recommend to anybody to visit Malolo Lai Lai Island where Plantation Island Resort is. We loved the water park and all the activities. This place is amazing! My family had the holiday of a lifetime. The staff are incredible and so very friendly, They immerse you in Fijian culture and entertainment. I recommend hiring Bula Bikes, it makes getting round the island much faster and it’s great fun. The food at the buffet was great! I would go back in a heartbeat. Definitely a family friendly place to go. Travel online gave us a great deal that made it affordable! Overall met expectations. Staff were lovely. We enjoyed our stay and were happy with it for the money we paid. As a family with teenagers we found Plantation Island to be very relaxing and really enjoyed our stay, accommodation in the Garden Bure was perfect. We have been there twice and would definitely return again. This was our second visit and substantial improvements had been made and continue to be made. Activity options are amazing and not expensive. Snorkeling straight off the beach is excellent, even had our toddler with us in a life jacket and no problems. Very kid friendly and a very friendly place in general. Will be back again for sure. We loved the atmosphere, grounds and activities available at Plantation. The staff are friendly and helpful, the food is plentiful. The waterpark with kayaks and stand up paddle boards is a real highlight. Looking forward to another visit! So much to do, beautiful setting, clean rooms and great entertainment for the kids. Great service, beautiful atmosphere, very welcoming. we all enjoyed.. Perfect location, friendly staff, food ok, ideal holiday for kids, families or small groups with plenty of activities to keep busy, relaxing and enjoyable, accommodation spread out across the island so bike hire is a must. Not suitable for people who struggle to walk long distances. Overall experience great, would visit again! The best family holiday we could have ever asked for. Really friendly laidback resort great for families. At that time of year for a winter getaway it's a good option. So much to say...the island is stunning. The water is so clean and clear and the tropical fish are everywhere. Love that the resort are doing coral restoration. The resort is such good value, especially for families but that doesnt mean its only for families. The beach activities are fabulous and the new equipment makes it all the better. The staff are super friendly especially if you make the effort to talk to them. They are great with children too. Its convenient having a salon there and they do great mens haircuts. The resort is undergoing renovations at the moment (doesnt impact on guests as its down the end)...so its only going to get better. The food at the buffet is ok but the black coral restaurant is better. In all- highly recommend Plantation Island resort for a holiday. Great resort overall with lots of activity and nearby natural attractions to keep the whole family happy. Food was a pleasant surprise in its quality and diversity. Sunset wedding under arch on beach & best location for a great relaxed holiday. We enjoyed everything on offer from beginning to end. The only regret was that we only could book a 5 nights stay. Our special thanks go to our Wedding Coordinator Tema & Celebrant Miri who were absolutely fantastic. We hope to be back for our anniversary. This was our best family holiday yet. So much for kids, cheap nannies and just beautiful island. Best part was the food! Amazing chef! Great place to take the families. So much for the kids to do. Friendly staff. We had the best time, our accommodation was on the other side to pools & restaurant but we hired bikes which were fun (a little pricey). The view was worth it. I couldn’t stop taking photos. We would definitely stay again & recommend to family/friends. I have been to Plantation 8 times and just keep going back. Traveling by myself I feel safe walking around the resort and to neighbouring resorts. The staff are so friendly and nothing is to much trouble for them from front office to the kitchen. The grounds are always beautiful and clean and the rooms are done each day if you wish. The whole team at Plantation work as one and introduce you to the most beautiful people in the world. The waters are clear with snorkeling off the beach into the magical coral and marine life. Environmental protection is important to the island from a small coral "breeding" colony already housing protection for the smaller fish, to not using plastic bags, to having a regular beach cleaning campaign which is fun for every visitor. I cannot recommend Plantation Island Resort enough to any visitor to Fiji. We had a fantastic time at Plantation Island. Friendly staff, room was great, only downside was a bit of construction works at the time but we were advised prior, and we know now next time we visit it will be even better. Even my husband relaxed - which he never does! Kids had a great time too!! Will definitely go back!! We loved our stay at Plantation Island Resort, the kids had a ball. Staff are so friendly. Our youngest child is 3 so had to hire a nanny a few times to watch her in kids club etc. Nannies are great and so cheap we generally gave a little extra each time. Our room was a bit far away from everything but after we hired bikes to ride we actually liked the location. Beach is awesome, lots of equipment to use and pools were great. Only downside I found was the food, buffet breakfast and dinner was OK but could have been better. generally food and drink is quite expensive but not too bad when converted to $AUD. I would definitely be happy to go back there again. Beautiful, fun, relaxing, joyful! It was an absolute delight staying on Plantation Island and having such great access to the reef. We all enjoyed snorkelling right out our front door, (I highly recommend the beachfront bures) and the waterpark was a hit with us all. The staff are incredibly friendly and the whole organisation of the Island and the connecting transfers ran smoothly. We waitied a while for drinks at bar staff are bit slow or not enough on at happy hrs. But over all we will be back as kids loved it and was relaxing for hubby and I. Enjoyed the stay, lots of activities for kids to do, great snorkelling. This was our first overseas holiday and was perfect for a young family like us my two year old son had a ball and so did we! Stayed here before, property has been updated since then with more works underway, recommended for families. We have just returned from 11 nights in Fiji with 5 nights at the Plantation Island Resort. Having to leave the resort was the only bad part of our holiday, we NEVER wanted to leave and now have severe post holiday blues. Our family of 5 and our friends (also a family of 5) stayed in side by side beachfront bures, with hammocks to relax in and the beach literally a few steps from our door. The activities for the kids were endless and they didn't even use the kids club (which I heard was fabulous). We snorkelled, rode bikes to Musket Cove, visited the village on Malolo Island, kayaked, sailed, got massages, went on the inflatable waterpark, fishing charter, and then there was the relaxing by the pool or beach. Thank you to the wonderful staff and people of Fiji for a fabulous holiday! We will be back (we would come back tomorrow if we could). Although the resort itself is a little run down, the kids had a great time. Lots of beach to explore and things to occupy their time. Standard of food exceeded my expectations. This was our 3rd trip to PIR and once again we loved it. We absolutely love this island and will be back for our 4th trip. The location is great, they have well protected beaches on both sides, if one side is a bit windy then the other side will be flat so always great for swimming and snorkeling. Kids loved the waterparks and snorkelling around the jetty, as that’s where the best coral and fish are. We were 2 families travelling, 4 adults and 6 kids in total, aged from 6 to 12. Kids enjoyed kids club, always plenty for them to do there, they have an indoor and outdoor play ground, trampoline and even a jumping castle made an appearance. The Bula Bikes were great, although it can get expensive if you start hiring for multiple days but the staff were very helpful and even struck up a deal for us. The bikes came in very handy when we needed to get to the Traders Market at Musket Cove to get bread as we took a toaster to make a quick breakfast for the kids. We took a lot of chips and biscuits to snack on during the day, we still ate lunch and dinner from the resort. It’s a lovely resort in a fantastic location, be sure to do your research and have a plan of what activities you want to do, although your on Fiji time your holiday goes very quick and soon your back to reality. Vinaka to all the staff. Exceeded my expectations, was such a great easy holiday with kids and we'll be going back soon. Fantastic holiday, great snorkelling and friendly staff. We will be back. Bula. We are a mature age couple but enjoyed our time immensely. Our family are looking to stay with a group of friends in November and the children will have an absolute ball. The beach, water, and views are beautiful. We managed to score a gorgeous sunset on our last night there. A couple of days were affected by the cyclone off Tonga, but we were still able to swim and walk around. The Ol Copra Shed/restaurant appears a little dark and would look amazing with lighter furniture, fixtures and painting, but otherwise the staff were atypical Fiji - friendly, smiling and ever helpful. If you need supermarket items, the store at Musket Cove - a 10 min walk, has a great variety and at good prices for an island shop. We had a 2 bed garden bure and it is spacious and clean. Would love to return. You can't beat Plantation for location, picture perfect beach with fabulous snorkeling straight off the beach. Always lovely staff. Accommodation is fairly basic but adequate, be sure to take repellant as mosquitos are big and ferocious. Breakfast buffet is extensive and dinner perfectly acceptable but if you want decent coffee you need to go to the little coffee shop. We were fortunate enough to be there for the Valentines day dinner (extra charge but worth every penny) The chef excelled producing a meal as good as I have eaten in hatted Sydney restaurants, fillet steak and lobster tail, and even a chocolate sphere with honey panna cotta inside, which melted when the warm sauce was poured over it. The staff are the most friendly helpful people you could ever hope to find. Nothing is too much trouble. The pools were fabulous and nothing is crowded or rushed. Truly enjoyable family holiday destination, we will be returning. We have discovered a holiday paradise for our family. Paradise as paradise should be. Clean rooms, friendly helpful staff, fresh food daily, loads of activities to enjoy, entertainment, cultural walks, something for everyone, crystal blue waters, daily cruises to enjoy, best of snorkling, bikes for hire, a true paradise. Great resort location and facilities for what you pay. Recommend the bike hire. Me and my family loved Plantation Island Resort amazing location, heaps to do for people of all ages. Very beautiful and relaxing. Food was super tasty but was expensive. Highly recommended. Great Place, Great holiday. Bula Bula. It was great we all had a great time, the stuff were very welcoming. we enjoyed the weather, the beautiful sea, the water activities, the smoothies. A great stay. Terrific welcome, lovely people. A good beach with a reef with good snorkeling and tropical fish. A well kept site and a good choice of food and drinks. A haven for relaxing. Compared to other Fijian resorts I'd say Plantation has more kids/families, less night time activities and bar life. All in all, the service wasn't the best in Fiji, but for the beaches and value for money it was pretty good. I'd go back. Plantation Island was absolutely fantastic. We loved our holiday and will be back. We loved our stay at plantation resort. We travelled there as a part of a wedding. The room was a 2bdr garden bure, which for our family of 4 was more than big enough and would certainly cater for a larger family as well. Over all the people and service were all amazing with only a couple of people / staff who were not so friendly. I have stayed at Plantation Is. before but they have renovated it since. The 2 bedroom garden bure that we stayed in was excellent. Perfect for our family of 4 with still being able to use the lounge when the kids went to bed. Although it was a garden bure it was only about 30m to the beach, with a slight sea view from the patio. Highly recommend the room type. The resort itself is great for families, kids club is perfect with their daily activities and the babysitters were amazing and cheap. My daughter didn't want to leave her babysitter when we went home. Choice of restaurants were good, highly recommend Black Coral the food is fantastic. We had the meal plan and highly recommend it. Overall, loved plantation island and will go back again! The resort is a favourite. Lots to do. Staff wonderful. I have stayed at Plantation many times and it is always lots of fun. Staff are so welcoming and willing to help. The island itself it beautiful. The owners have been renovating over several years and have updated bures and added new ones. Our family really enjoyed our time at plantation island. Awesome children’s facility’s and wonderful location. Food choices were a bit limiting but we were able to explore the surrounding resorts for a bit of choice this did however increase the overall cost of the trip. Overall a wonderful experiance that we would book again. Stayed at plantation island resort for 5 nights with 2 kids (6,2) and we all loved it! The island itself is beautiful and water is amazing as the photos! The poolside room was clean and spacious and had a nice Fijian vibe, it wasn’t modern 5 star hotel room but wasn’t bad at all. All the staff there are so friendly, kids club was great and always did cool activities which Mr 6 loved. We also got a babysitter several times for Mr 2 which I was hesitant about before arriving and seeing for myself, they were great! Breakfast buffet was great and had different themes for dinner each night our fav was Mexican. Cocktails and drinks were pricey but were delicious! We loved the beach and water sports, Mr 6 and his dad loved the water park! Packed reef shoes but didn’t need them. We really enjoyed jet skiing and the $20 snorkel! Massage was really relaxing but book in early! Also recommended hiring bikes as there is a fair bit of walking around the island. Overall loved plantation island resort and would definitely return! No Hurry No Worry, that is the Fijian Mantra, we LOVE Fiji and once again used Travel online to book our third trip. From booking our holiday to coming home, everything went as planned. The website is easy to use and someone is always on hand t answer a question. Thank you Team, we cant wait to do it all over again. Location is paradise, facilities are definitely 3 star. You cannot beat this location. A gorgeous island paradise. We stayed for 6 nights and thoroughly enjoyed ourselves but you do have to expect 3* facilities. The staff were mostly really friendly and once we'd found the black coral restaurant we were happy with the food (the buffet was not our cup of tea at all). The Oasis pool was lovely, the ocean pool adequate for kids but the kids pool was pretty ordinary with a slide and no shade at all. The highlight of our trip was the school tour and the snorkelling - both amazing. Drinks and food were very expensive - glad we took some of our own for lunches. Overall we had a lovely time. Overall stay was perfect. Perfect location for a family holiday. Staff were very friendly in the activities area and most resturant and bar staff were too. Pristine beaches, snorkelling at your doorstep, free water activities, 3 pools to choose from, water park to amuse the kids for hours all on a little piece of paradise. This was our 2nd trip to Plantation and none of us wanted to leave. Highly recommended for families with kids. Great location for beautiful beaches and snorkling. The water park is great for kids. Beautiful location.Lots to do for families, kids loved the water park and kayaks. Fantastic snorkeling off the beach. Staff could have been more helpful . We booked Plantation island for a family holiday because my husband & I had been there three times previously & it really didn't disappoint. Stunning part of the world and the FIJI people were great. The kids had a good time. Amazing place to stay. So relaxing and great facilities to keep the kids busy. 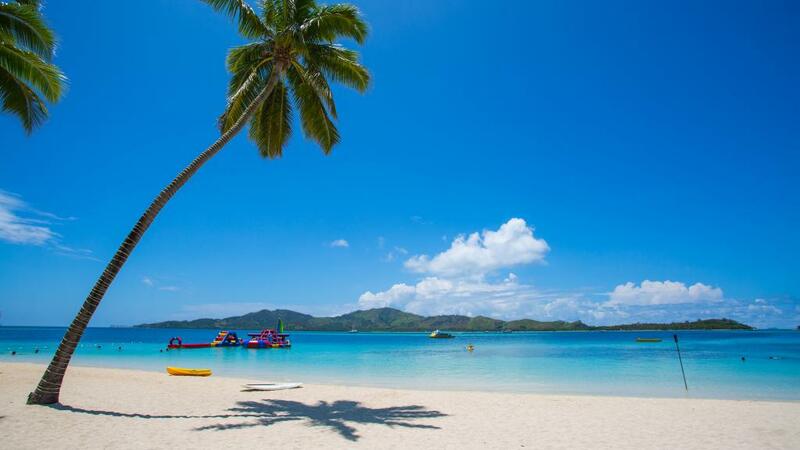 The postcard perfect fiji island getaway. Great food, amazing views and food. Couldn't fault it! We love plantation. This was our 4th trip and everything was awesome. Every time we return we are greeted by staff who remember us. Can't wait till next year for our next trip. We had a wonderful time at Plantation Island Resort. Beautiful people and a lovely destination, waterpark fantastic for our kids (aged 13 and 11), bikes were a great way to resort hop. The only criticism was were looking forward to 'fresh' fruit and veg by day 5. Very relaxing, loved it. Was beautiful and relaxing. Time slowed down. Staying beachfront is really worth the extra. We will definately love to go back asap! Kids loved it, we loved it. Beautiful spot and perfect weather. We came back fully relaxed and chilled. Plantation has everything you want in a holiday. This was an ideal resort for families with lots to do - sailing, paddle boarding, snorkelling and an awesome water park. Not ideal for adults due to multitudes of children. Dining options were really limited, possibly due to one of the restaurants being closed for renovation. If you don't fancy the buffet and want to go a la carte (where the food is way better) you need to book at least a day in advance. The Snack Hut is awesome for cheap food but limited opening hours. Overall a really enjoyable stay. Our first time overseas as a family and couldn't of picked a better place. Amazing all round. Planation island was a wonderful holiday for my family. the kids had more than enough activities to keep them VERY happy. The kids club was fantastic. The flexibility of the eating plan meant we could feed the kids early and then eat an 'adult' dinner a bit later without any hassles of two dining times. Overall a wonderful holiday and a place that we will be returning too. What more could you ask for. .....perfect weather, swimming, activities & Fijian people. We love Fiji as our family holiday & have visited on 3 occasions now & each time we relax, have fun & enjoy ourselves so will definitely be back. This is the ultimate Fiji time experience. The resort is casual, friendly and relaxing. Our family had an amazing stay at Plantation Island Resort and once again the staff were fantastic. We all enjoyed water sports, endless days of swimming in crystal clear water and smiling staff everywhere we went. We can't wait to return. Overall the stay was lovely. The resort is generally looking a little tired and could use a wee facelift, but this didn't get in the way at all, and the rooms were clean and well maintained. Food options are pretty limited, and the main restaurant is a little overpriced for what you get. There are loads of fun activities on offer. The staff were, without exception, super lovely, friendly, helpful.. extra big shout out to the beautiful team in the CocoHut. Great personal service and so so lovely. Loved the place, chilling out on the island and just relaxing. Getting there and back was hard work with the kids but a stop off at the Day spa at Nadi on the way home was well worth the visit. The snorkelling at Plantation and at nearby reefs was sensational. I'd go back there tomorrow. A great family paradise. Plenty to do. Beautiful, amazing snorkelling right off the beach. Views, weather, location stunning. Many buildings need a paint or a spruce up, but every activity you would want with a young family, excellent buffet with good variety, and an endlessly warm and helpful staff make Plantation island a wonderful family holiday. Our daughter loved the kids club which included craft, playground, bouncy castle, cultural activities, sports and beach games and even Fijian Dancing. She was begging us to let her go there! Good holiday. Service was always amazing. Probably would of liked the option to have the stand alone Bure that was actually bigger and had walls to the ceiling and separate rooms. Loved everything about the holiday. Best holiday! Couldnt fault plantation island in any way. We will be back next year! Highly recommend for families. Our kids loved kids club and wanted to stay with the babysitter. So many things to do and everyone is so friendly and extremely welcoming. Can't thank the staff enough for making this the best family holiday we've had! We will be back next year. This is a great destination for families with everything well set-up but the "welcoming" staff member we had has room for improvement. The Black Coral restaurant service wasn't good and the food was average but the buffet meal in the other restaurant was good. But in spite of these little glitches, this is a great destination for a family holiday. Great atmoshere, friendly staff, plenty of activities if needed or quiet areas to relax . Fiji is getting a little expensive! Beautiful location, great for families , loved it!! Second time at Plantation. Yes needs a bit of an update. Beachfront Bure fantastic , friendly staff , snorkelling and kids facilities fantastic ! Love this place. Will return for sure ! We really enjoyed our time at Plantation Island. Our kids are 12 and 14 and could roam around the resort freely and enjoy the many things to do with or without us. The beach huts are really close to the water and the view is beautiful. The staff are lovely and the food in the dining area was great. Don't have expectations higher than 3 stars otherwise you may be disappointed. It was a fun holiday and one I would highly recommend! We continue to return to Plantation as you are part of the Family. If you want to do nothing and just play with kids and swim, ride bikes. this is great. The food is very simple, Breakfast dinner plan is the way to go as very expensive if not in package. snack bar if you want lunches is the best bet. Rooms are clean but not flash. Have not found a better location. We are a family of 6, and we just fell in love with Plantation Island!! The location was just perfection, the grounds were amazing, surround by fabulous beaches, amazing snorkelling straight out off the beach! We really enjoyed the food, and the staff were beautiful... We cant wait to go back..
Really enjoyed our holiday as you can do as much or as little as you want which was nice. The staff are always happy to see you and treat you like you are family. So relaxing and perfect to recharge. Resort staff are beautiful people. We spent a wonderful family holiday at Plantation Island Resort at the start of November. This was our second time as a family to have our holiday there. This time we were lucky enough to go with our parents and sibings. The location and atmosphere is relaxing. The staff are accommodating and always go that extra step to make your stay enjoyable. We celebrated two birthdays while on the island and the kitchen staff made the most yummy cakes and the staff sang the birthday song which was a great experience. Dan at the dive shop is very helpful and we were happy to see him again. The kids club has a great range of activities to suit all ages. I recommend going out to Cloud 9. It was worth the trip. Anandas Restaurant has a diverse dinner menu and the playground next to the restaurant was great for our daughter to play in whilst we enjoyed our dinner. Thank you so much to all at Plantation Island for our enjoyable and relaxing holiday. We will see you again next year. As a one parent family and taking your children for their first OS holiday you can imagine l was looking for value, feeling safe and a beautiful location. Well Plantation island was all of that and more. Every thing was fantastic, from the island Staff to the cleaning of our room, delicious food and entertainment / activities. Loved our poolside room so convenient and the views from the beach were Postcard my camera had a workout!!! My children have already asked when are we going back!! So back to saving to get onto that and to make more wonderful memories. Thanks again Plantation Island you have made my family very happy!!! our second stay at Plantation.. We'll be back. Couldn't fault it! loved it. We loved our 5 day stay at Plantation Island. There was so much to do, and so much on offer every day. The waterfront and beach areas are easily accessible, the snorkeling was amazing. Food and drink options were good, we were happy with the buffet options while we were there. I would advise getting pre-purchasing a meal plan for your stay. the staff are beautiful and make every day wonderful. Our room (2 br garden bure) looked a bit tired, about ready to be updated, BUT we didn't spend much time there as we were too busy doing activities! Ideal destination for holidaying with small children, we were really pleased with the way the resort is set up to cater for families and children's needs. Perfect location and a thoroughly enjoyable holiday. Awesome! Relaxing and the big and little kids loved it. Beautiful location with beautiful fijians! Will definitely be back! Planation Island Resort is a great destination for family vacations it's geared up great for children to have a wonderful holiday. I had an amazing stay at Plantation Island Resort. Spent the last 2 weeks of a 3 week holiday at the Island. The location is great, just a short trip off the main island, and the bay where the resort is, is beautiful. Be prepared to wait at the two restaurants, time between ordering and getting the meal would be 45 mins on most occasions, and the order would need to be followed up. On the up side, the facilities at PI were great. The Bure’s were well maintained, cleaned and serviced daily by very friendly staff. I think the small tip I gave the 1st week helped get a top class service, so well worth it. There was plenty for the kids, especially younger ones from around 1-10/12yrs, with 3 pools to choose from, excellent beach with good snorkeling, kayaks, bouncy castle things just off the beach, baby sitters etc and more. Sad to leave, and an extra week would have gone down well. Highly likely we will return to PI another time, and would recommend it for familes with young kids. The downside was no service to the rooms for food and beverages, bedroom walls that didn't go to the ceiling (our children are noisy/ bad sleepers and some soundproofing was what we wanted from a 2 bedroom bure. The quality of the food was not particularly consistent. The kids did love it and the location is absolutely gorgeous. Great relaxed destination for families. Great location and down to earth set up for families. Lots of water activities included in the price, and good kids club. Our poolside room was awesome in the afternoons/evenings. Rooms are a little dated but roomy, airy and very comfortable. Could be more guidance/information provided on snorkelling trips etc both prior to visiting (on plantation website) and at the resort. We missed out on some trips because we didn't know ahead of time that they were only available certain days. I would definitely consider the time of the tides if I go again - high tides in the middle of the day make for a much better experience if you are into water activities. Great place for families - plenty of activities for young and old. Overall a pleasant stay. Some of the kids activities were a bit repetitive so suggest that they vary it on at least a 7 day cycle as not many families stay for more than a week. Although the waterpark was new, some of the other equipment is now a bit dated. This island is paradise and the staff who working there are just so lovely it makes your trip even more enjoyable. This is a wonderful place to spend a holiday as a couple or a family. The free water sports were great. Rooms were super large and well looked after. Overall the resort was what was expected for a 3 star resort with the fantastic location and staff making the stay really enjoyable. We took our 3 granddaughters (6, 8 & 9) for a winter holiday. Plantation Island was wonderful - the facilities, staff, the snorkelling, the meals exceeded expectations. The girls loved it all - and all slept very well each night! The buffet meals had something to appeal to all tastes, making meal time very easy. Anandas also catered well for adults and children. The mocktails were a real hit. Could not recommend the resort more highly to families. We went to Plantation Island with our two daughters and had a wonderful relaxing holiday. I would certainly recommend this resort to families though. There were so many activities for children of all ages and the kindness and hospitality of the Fijians were terrific. Would highly recommend Plantation Island. Such a lovely family holiday! Water activities and excursions really made this trip. Great location. What a heavenly place. The people are just so special and friendly and the Bure on the beach was other worldly. We were fully relaxed within 24 hours.... not bad ex-Sydney! The kids were totally well sorted too. Always plenty to do, so safe and fun. Only problem was we ought to have planned to stay 10 days or more as it was too sad leaving after just 7 days! Great family holiday location. Plently of things to see and do, kids club was great. Quality of food at the buffet Restaurant was mid range but the meals at the other Restaurants were good. The whole Resort had a very social warm friendly atmosphere. Plantation island was everything we expected and more. It was truly a tropical paradise. The snorkelling was terrific just off the beach the boat day trips were fun and the kids enjoyed sand sun water and riding around the island. The Fijians are the most hospitable people we have ever encountered on our travels. We would go again. Fiji time is relaxing. Island hop tours to go snorkeling are great. Water warm. Very friendly. Plantation Island - after 36 years doesn't disappoint! Our family loved our holiday at the end of June, celebrating mine and my son's birthdays. We enjoyed our poolside room. The food was tasty and fresh, the breakfasts were amazing. All the staff were friendly and helpful. Our 10 and 8 year old girls loved the kids club. We'd love to return and will recommend this resort to other families. We had a beachfront bure which was much better than expected. The staff were very helpful and friendly. We could snorkel straight off the beach outside our bure and the fish and coral were fabulous. The kids rode bikes (hired at resort) around the resort - quite safe to let them go on their own. The Black Coral Restaurant was the better dining option. Loved our trip, second time to plantation island and it was the best! So good for kids, staff are very friendly and helpful, food is amazing, room was perfect. Even though we found it a bit expensive for the quality of the rooms (quite old, noisy), we absolutely loved our stay in Plantation Island Resort. The grounds are just big enough to spread the kids all over and not be too bothered by noise and crowds, while at the same time being compact enough that you can walk anywhere within 5 minutes. The beach is beautiful, although the snorkelling from the beach is quite disappointing with most corals bleached and not many fish. Lots of coconut trees with enough hammocs for everyone to lay in the shade, and the island is big enough to make a morning run or a bike ride worthwhile. The kids club and the nannies are so nice to have for a bit of quiet time while the little ones stay entertained and spend the energy too. The buffet food was ok although not fabulous, however Ananda's restaurant was fantastic both in terms of atmosphere, value for the kids with the playground, and excellent food. This was our first Fiji experience and we found it so relaxing..... how couldn't you relax in such beautiful surroundings with such beautiful friendly people! As it was my third visit to the island I was still impressed with it. A few things have changed, as in charges for snorkelling, a high price for shell village. Muscat cove only charge $3 per person. All in all we had a nice time, but definitely a very family orientated holiday place. It was my mums 80th birthday and she was made to feel very special by all the staff. A huge thank you. Beautiful destination, but the food and cocktails aren't amazing, very basic. Richie and Billie boy are great hosts. Whether holidaying with a group, family or just looking at a couples getaway, plantation island caters for all. We always try and stay in the main area of plantation island resort that is a 3 star resort and utilise the rest of the islands opportunities with sunsets at Musket Coves Rum bar, cocktail in hand or heading to Lomani adults only resort for a wonderful seafood platter. Even purchasing your own food from the supermarket and utilising the BBQ,s at Musket Cove. We found we were able to cook up a storm for up to 15 family and friends for $10 per head Fijian. Great for the budget to do other things like island hoping, jet skiing between resorts or heading out for a surf or dive. Plantation Island Resort is an amazing resort that is not trying to be anything more than it says it is. Its facilities are fantastic and its location is brilliant with other resorts and facilities nearby that can be accessed by guests. This provides other options for eating and activities. The resort itself and the island are both big enough to keep everyone occupied. The staff are fantastic. The rooms are being upgraded currently and are absolutely perfect for a 3+ star resort. I will continue to keep going back to Plantation Island Resort. We took my three grandchildren for a week and it was excellent with a great mix of activities in the kids club and also family time. Staff always friendly and food great. Family packages are great value especially if you are with kids under 11 years. Always felt safe and comfortable. Perfect resort for younger families. Well organised travel by Travelonline. This resort is 100% aimed at families - which means you don't have to worry about your kids being noisy or talking to the table next to you. The staff are really friendly and go out of their way to make you feel welcome. Our only negative is the cost of snacks etc on the island. That was a bit of a shock. We recommend going to a minimart on the mainland and stocking up on snacks and possibly drinks before you head out. Some of the facilities are looking a little tired but are still nice enough - it is 3 star after all (with an equivalent price). We are really happy with our choice of resort and will definitely go back. Travelled with two children aged 9 & 10. They had a great time with all the activities on offer including free paddle boarding, snorkelling, kayaks, water park on the beach (like a floating it's a knock out blow up maze), bikes, etc plus additional activities to puchase including sea fishing for the Dad's. Although service was relaxed, staff were very friendly. Food (at buffet and restaurants) was as expected on a budget resort. We had a great time. The Best Resort in the World!! We have just had the most amazing holiday experience. The Plantation Island Resort has completely gone beyond our expectations. The people are the nicest you will find anywhere in the world, their attitude towards customer service is exceptional. The kids had such a great time at kids club and were kept very busy for the day (along with some down time to watch movies) and the activities on offer were fantastic. We did day trips to the other islands and snorkelling trips were we got to see lovely sea life. We couldn't have had a more relaxing time too. The beachfront buree was lovely and well maintained. We are planning our next trip now for next year. Thanks so much Plantation Island Resort. Fantastic location they just have to fine tune the food options. Overall the stay was amazing! Thank you so much to all the staff for being so happy and helpful. The food was mostly good but did disagree with us after a few days in. Mainly the Buffett food. Would I return? Bloody oath! The location was awesome. The staff were helpful and friendly. Plantation Island was well suited for families. I would definitely want to go back. From the time we arrived and were welcomed by singing locals through to the end of our stay we were made to feel welcome. The food was good. The locals and staff were always helpful and friendly. Absolutely beautiful setting. Wonderful experience. Will be back. Great staff, nice accommodation, great location, staff are very friendly. We have returned to Plantation 6 times now it's a very relaxed holiday destination. Sad to see the end of our time come. Perfect location, excellent snorkelling, super friendly staff. My daughter was married here and everything about her tropical wedding was superb. Highly recommend to everyone . Loved the room we stayed in and the staff were all so friendly and helpful, would definitely recommend this place to others and would love to visit again. The staff were very friendly and helpful would defiantly stay again. My 3 young kids (7,5 and 3) and adult enjoyed this place immensely during December 2015. It's a great value proposition for one family or, for huge fun, bring friends too! I've raved about it to people at work. The other guests, from all ages and walks of life, seemed friendly and relaxed. Certainly, we had fun while mixing. Despite the pessimism of the weather forecast, we had rain only 2 days out of 10. No dreary clouds either, we spend a happy 8 hours a day on and in the water snorkelling (at the resort and the close-by reef @ $5 pp per trip), kayaking, and jumping from the swim pontoons. Brilliant! Playing pirates with random people who were using the pontoons at the same time, double brilliant!! Scuba nearby was also worthwhile, well organised boat and diving. Babysitter service was cool enough. Admission here, I'm spoiled from previous visits to 5 star places where one assigned nanny per bub were included in their quite higher prices. Honestly, getting help with the kids is great, and makes the holiday for me. But when I have to ask, and organise each day at a time, I feel a bit guilty. So, the 5* places remove that guilt, for a fee. Food at the main restaurant was above par for Fiji; go with the package to save a few bucks. We went to Lomaki resort one night for a romantic outing. Lovely setting top marks, but slightly haphazard service, and food quality let them down. Not repeated, or recommended. Went to Plantation Island in Jan 2016 with 2 kids (9 and 5). We all had a great time swimming in the ocean & pools and using all of the complementary activities like stand up paddle boarding, sailing, kayaking, tennis and putt putt golf. We will definitely return. Only negative was that service was usually very slow with food coming out (and taking orders) at lunch & dinner. But overall a great place to visit with the family. We spend a 7 nights at plantation. We had a fantastic time. Pool side room was brillian for our boys. Watersport keep us busy. Beautiful beach and clear water. I would love to go back again. The room we were given was right at the back very noisy with tractors going all the time.staff tend to forget request . I had to remind them of the $50 room credit to be taken off. Overall most of the staff was very pleasant. I think it is more suited to younger families. We loved all of the staff at Plantation Island, the room was very comfortable and the ladies who service the rooms were beautiful. If you go to Plantation Island, do not take up the meal plan which restricts you to the buffet every night, as the buffet is a big rip-off. The other restaurants that are available on the island, such as Ananda's, Black Coral and nearby Lomani are much better value. Please do yourself a favour whilst you are there and go to Cloud 9, best pizzas and the guys out there are so much fun. We stayed for 5 nights in room 234 which was a fabulous spacious 2 bedroom villa one row back from the beach close to everything without being noisy. The aircon worked a treat not noisy. Room was cleaned every day staff were super friendly. Kids didn't use kids club as they were a bit above it. 11 & 13 was mostly for around 7 and down I think... Loads of extra activities to do some expensive ie fishing was about $560 for 3 hours. We went on the Dolphin tour which was fabulous saw a pod of about 15 dolphins. Snorkelling was a little disapointing needed to go on tour to see really wonderful stuff but that was cheap. Plantation Island Resort great for a family holiday. Kids eat free was fantastic value as meal packages are quite expensive. Staff were so lovely...No worries no hurry...allows everyone to just chill. Fun trip, nice amenities and great location. Food and drink service wasn't the greatest but we were on Fiji time. Plantation island was amazing and perfect for families. This was our 3rd consecutive year to Fiji and first time staying at PI. We'll be returning there from now on. Absolutely perfect and recommend the poolside rooms. Food at the buffet was amazing. Tried Ananda's restaurant one night for a change and it was not good. So we stuck with the buffet as the variety and quality was excellent. Special mention to Marica who had a big smile and chat for us each day, she is beautiful. HEAPS of activities, snorkelling just off the beach in front of our room was great, hire of snorkelling equipment/kayaks/towels, etc. was a breeze. All activities/tours staff were very friendly and helpful and answered lots of our questions. Beachfront Bure was AMAZING. Heaps of room, very very clean and the best view in the resort- hammocks were a nice touch. The only thing I didn't like was not having an ashtray as my husband and I both smoke. Most of the staff were wonderful- typical Fijian hospitality, big smiles and beautiful personalities, very helpful and attentive. My biggest gripe is that there are no ashtrays ANYWHERE in the resort. When we asked the bar staff for an ashtray on the first day they told us to "just put them in the sand" We absolutely hate doing that so we would put the butts out and then put them in our pockets/bag to put in a rubbish bin later. All in all, a fantastic family holiday. Would not recommend this resort to couples/ honeymooners as there are kids galore! Other than the few small things I mentioned above, the resort is great, good value for money and never short of things to keep one entertained. Found it very hard to leave, third trip to Fiji and I never want to go home! Great for kids and families, we had an excellent time. The kids club is amazing, couldn't drag our kids away. Renovations made eating / dining a little hard, but not a major problem. Rooms are a little dated, but still add to the charm. A toaster and a little bench space in the kitchenette would be handy. Fijians must be the friendliest people on Earth!! Great stay!! Beautiful island and great staff. Enjoyed a relaxing time in the resort with the company of beautiful Fijians. The resort caters for all, the waters are spectacular the fish and snorkelling awesome! Quick boat trip out to the surf breaks was the most surprising surfing daily for hours on end but next time will look to include the cost of trips if I can.